I’ve used it for a lot of clients on specific landing pages. If Yelp filters the review, the review still appears, but the review stars switch from red to the dark gray. The link back to the actual user no longer works, either – the review only links back to the business. Thanks for letting us know that Phillip. It is good they have a process in place for embeds if the review is filtered. Nice info. Didn’t know about it. Our smb types don’t naturally attract reviewers. We use “review management”. We ask for them. Unfortunately most of the yelp reviews we’ve received for our most reviewed smb’s end up in the filtered “not recommended” section. Cr@p we have two smb’s with a high number of total reviews including yelp and they respectively have 60 and 80%+ of the reviews being filtered. But you do get a notification from yelp when it first shows. I’d use the embed code ASAP. Anyway nice advise and nice opportunity to get yelp reviews to be seen on your site before they go into the yelp netherworld. Dave, I know what you mean with the filtered. Yelp has been known to be the strictest filter, and people without much activity or just one review are guaranteed to get theirs filtered out. It seems like Yelp’s system doesn’t really work very well for industries that don’t get a lot of reviews, such as smaller, non-restaurant service companies. You’re right about grabbing them before they get filtered. But I tried it out and I was able to get the IDs needed for the Yelp embed code from the page with the filtered reviews and those embed OK as well (slightly different with gray stars and an extra link to Yelp at the bottom). I’m going to work on that more soon for ours. Or at least point more people to a “Review Us” page, where one of the choices is Yelp. I’ve done that. It ended up being unproductive. We did try it. It of course makes sense, but in our case we weren’t finding enough matches. This is really good information, Phil. Thank you. And thanks to the commenters who added great info. I am going to try this immediately. Sounds like a good plan, Jennifer. Question for you, Phil: where would you recommend embedding these on the site? Reviews/testimonials page? Own page? Elsewhere? Totally depends on the site, on how many good Yelp reviews there are, and on what the reviews say. I’d put them on a reviews/testimonials page at the very least. I’d probably also put relevant reviews on pages for specific services and on other “money” pages. How does this work with the revised review schema guidelines from Google? 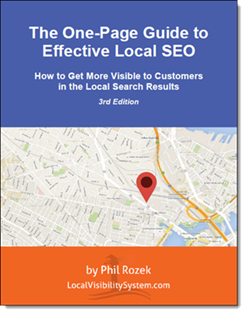 I thought that with the review update last year (http://searchengineland.com/google-updates-local-reviews-schema-guidelines-257745), reviews that were produced in 3rd party sites such as Yelp etc would be treated as duplicate content if posted in your own site. I had the same issue. I found I could set min-width: 350px; for a container div and that prevented scrollbars on the yelp embedded review. When I inspect it, I see the iframe has max-width: 700px; min-width: 320px;. It seemed to obey the 700px max-width but not the 320px min-width, perhaps due to some conflicting CSS which I could not find.